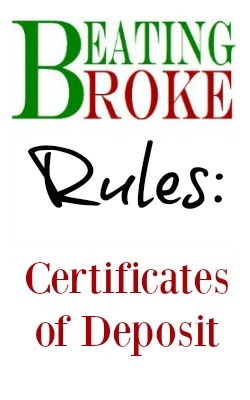 What is a Certificate of Deposit? Certificate of Deposit (commonly called CDs) are basically a savings account that pays a set rate over a set term. The rate tends to be higher than a normal savings account rate because the money is locked into the CD for a set term. If you choose to withdraw your money before the term ends, you pay a penalty. The penalty is usually a preset number of months interest on the CD. At the end of the term, you can renew for another term at another set rate or keep your money. CDs are a very stable investment. They are also a very liquid investment. As such, they make for rather poor returns on the long term and they carry a penalty for withdrawal before the “maturity”. However, there are several uses that can make them a valuable part of your financial portfolio. 6 and 12 month CDs can be a great place to keep your emergency fund. Chances are you won’t need the money, so you might as well invest it. The key here is that the CD is a safe, stable, and easily accessible form of investment. You’ll still get the higher interest rates that you would expect from a high-yield savings and, depending on the term length, sometimes better. As you get older, CDs can play an important role in your retirement accounts as a small percentage of your portfolio. Again, the stability and reliability of the nature of CDs makes is the key. As you age, a growing portion of your retirement portfolio should be in stable cash investments. Many will recommend something like a money market account or a high yield savings, but CDs are in that same group. And with a retirement account, you can usually tie the money up a little longer and get better returns. Look for something in the 2-5 year range for maturity. As I mentioned before, one of the major drawbacks to CDs is the early withdrawal penalty. In most cases (consult your CD paperwork) the penalty is 3 months interest. So, if you were to withdrawal the money after only three months, you would only be able to withdrawal the original amount. If you withdrawal the money at only one month, you would get less than the original amount. Anytime after 3 months and you get the original amount plus any interest above the three months penalty. While the penalty can be bad if you need the money early in the term, if you need the money for an emergency, it can be overlooked pretty easily. Is CD Laddering Worth the Trouble? I’ve been thinking about this for quite some time, but today’s post from DoughRoller with A Dead Simple Alternative to CD Laddering was the icing on the proverbial cake. And I think that DoughRoller is right. Or at least, what DR says is in line with what I’ve been thinking too. Here’s the basics. A CD Ladder typically is made of several 1 YR CD’s whose maturity dates has been staggered such that a new one is maturing about every 3 months or so. Depending on the variation, some may even have one maturing every month. It’s all in how you stagger the CDs. Because you have them staggered, your money is never completely locked away and you can always get to some of it every month or three months. So, any non-emergency expenditure can be planned for and the money from the most recent maturing CD can be used to pay for the expenditure. At some point, you replace the CD and all is back to where it was. My problem with all of that is that if you split $10,000 over 4 CDs, you get 4 $2500 CDs. If you split it over 12, you get 12 $833 CDs. That’s great, but what if you need to spend more than that? You have to cash more than one CD. Or you have to wait even longer until more of the money is freed up. It’s not a catastrophe. But it’s inconvenient. On top of all that, you’ll likely pay a penalty on any extra CDs that you decide to cash out. Again, not a catastrophe. The solution, as DR and I see it, is to take that $10,000 and dump it into a long term CD. Say a 5 year CD. Yes, if you need the money before that 5 years is up, you will still pay a penalty. But, the penalty is generally something like 3 months interest. So, as long as you’ve held the CD for longer than 3 months, the worst you can do is break even. If you cash it out in less than 3 months, you either didn’t plan well in the first place or you really have an emergency and you probably won’t notice a few months interest. The main advantage of this method is that all of your money is available to you at all times. A secondary, but nearly as important advantage, is that the long term CDs generally pay higher interest. So, if you leave the money for the full 5 years, you will have made significantly more interest than you would have with 4-12 1 YR CDs. As you can see, there are some pretty significant differences in rates between a 1 year CD and a 5 year CD. Ally only has a 60 day early withdrawal penalty. HSBC only has a 30 day penalty. ING has, by far, the worst penalties for early withdrawal. Any CD over 12 months term will incur a 6 month penalty and any CD 12 months and under will incur a 3 month penalty. Looks like Ally is the place to go. I think the strongest point for this type of CD investing is that I don’t like losing that extra interest because of a “maybe”. Yes, “maybe” I’ll need that money before that 5 years is up. But, I may not need it at all. And if that’s the case, I’d rather be earning the higher rate. And if that “maybe” comes around? Well, hopefully I’ll have had the CD long enough to override any penalty that comes with that. At worst, with those examples above, I would only need to hold the CD for 6 months before it would be an even transaction. Sure, I lose that interest. But, again, that’s only a “maybe”.